Snow, one of our wonderful cats, passed away this week. She is one of the special-needs cats and dogs that have come us from shelters, and who have been living together here as a special community in our home. One is partially paralyzed, some have histories of severe physical abuse, some have difficult medical conditions. For almost a year and a half we've been so concerned about Leon, who has a small aorta and advanced hypertrophic cardiomyopathy. The specialists involved in his care have said it is a miracle that he has survived more than a month or 2 after he began having serious heart problems. 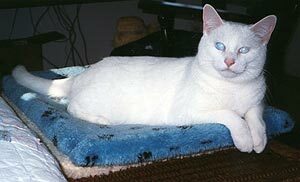 But late last week, Snow (who was blind since birth and has beautiful opaque blue eyes, and whom we adopted along with her mom from a shelter since they had never been apart and had some of the same problems) fell suddenly ill and went into renal failure. The blood tests, sonogram, and everything else failed to find a cause. She was in a critical care unit here to try to stabilize her. We did a lot of research, and had an appointment for her to enter a New York City center that offers hemodialysis, hoping that would enable her, over the coming weeks or months to become able to get a kidney transplant (which, having talked with the few centers that do kidney transplants, would have been at U of Penn or U of CA at Davis), but she did not make it. Snow was remarkable in so many ways. 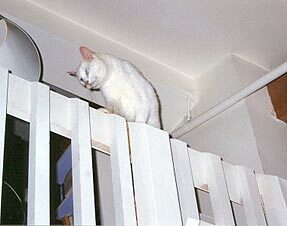 Completely blind (without shadow vision or any sensitivity to light), she made her way onto tables, window sills, the high shelves over the kitchen cabinets, up onto ceiling beams, and literally everywhere else that the sighted cats would go. She showed courage, resourcefulness, and persistence that have been models for us. She was fearless in playing with the dog, exuberantly joyful in playing with toys, and a wonderful snuggler. She was such a gift to all of us. View more photos of Snow.